See more photos on my Tumblr. From the beginning, the only protective clothing we wore were gloves and veils. But after becoming allergic to bee stings, I invested in a full bee suit. I've worn it through three honey harvests, which is when bees can be at their testiest, so I think I can give a qualified review of my UltraBreeze. Many Langstroth- or Warré-style beekeepers harvest once over Labor Day weekend, as in this photo, when the weather may be cool. 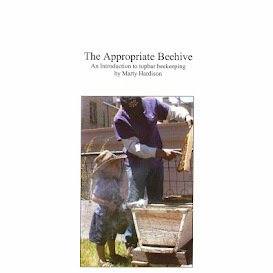 Harvesting from a Top Bar Hive, however, is done throughout the season. Particularly with a small TBH like ours, harvesting must be done continuously as a swarm control measure. 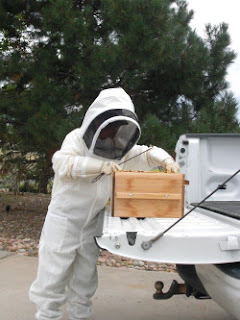 A Summer harvest often coincides with really hot weather when most bee suits are unweareable. The UltraBreeze is made of three layers of meshy fabric. This makes it a) ventilated, b) so thick that stingers can't reach you inside and c) heavy. Once you put it on, it doesn't feel heavy, though. While I've not had any issues with heat or stings, I do find the mesh challenging in a branchy environment. Sticks and twigs tend to get caught, particularly the hood if not being mindful of what's behind me. I tend to be very focused on the bees during an inspection, not on the environment, so I've walked away from hives with little twigs sticking out of my head. The suit is expertly sewn, and the hood, body and legs have super high quality zippers which add to the weight. The leg zippers are long so you can really open them up and put the suit on without taking off your shoes. The sleeves and legs are elastic-cuffed so bees can't crawl in after you're zipped up. I pull my long gloves over the sleeves and while it's a lot of material, my mobility is not hindered. The legs are generously long, for me, so crouching and kneeling to peer into observation windows is comfortable. The elastic cuffs secure around your boot shafts keep your ankles protected but, again with the mesh, sometimes I'll come up with sticks and twigs stuck in the knees. There is a small Velcro bit that seals the meeting of zippers at body and hood, which completely zips off if you'd like to use your favorite veil instead. The attached dome veil is just as comfortable as our Alexander veil or "hatless" veil, and visibility is perfect so I don't make any swaps. I've gotten into the habit of wearing a ballcap under all our veils, to keep the hair out of my eyes, and the UltraBreeze hood easily pulls over my head with the ballcap already on. The rim doesn't rub the screen, which tells you that it is held nicely away from your face. The suit has six pockets, two fully lined so your standard hive tool won't get caught on the mesh. I put my tiny point-n-shoot in the hip pocket, and it's easy to get out even with my leather gloves on. Even after I'm done with Venom Immunotherapy (in another 2-4 years), I'll be wearing my UltraBreeze. Yes, a sting or two won't kill me but they're just not pleasant so why not protect myself? Besides, the suit cost many pretty pennies and it would hurt me worse to have my UltraBreeze stashed away in a closet. Ultrabreeze makes a hooded jacket so if you're looking for a less costly alternative to the jumpsuit, that's an option. The Instagram image below shows a close-up of the fabric.